Here are some close up photos of a runner I think an ancestor made. It isn’t the neatest piece of work, but a lot of time went into it. 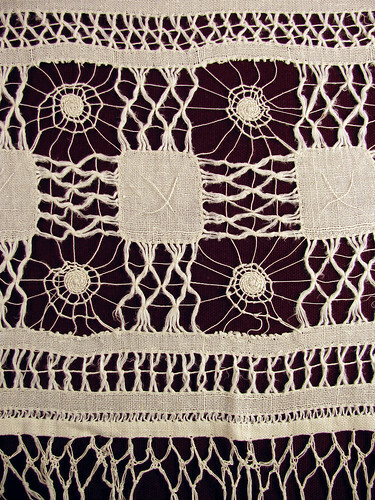 The two deep borders are worked in different patterns of needlelace banded by rows of drawn-thread work. Both sides have long tanglely fringe. 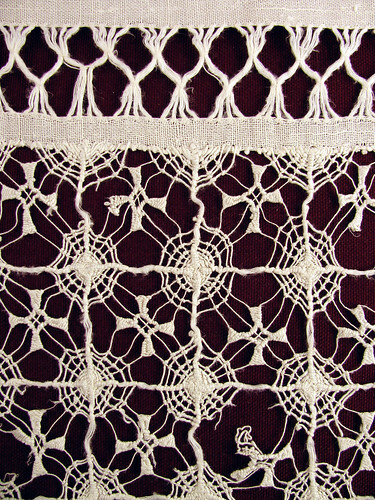 The needlelace areas are really large with big areas of thread drawn out. It is torn is several places, though being 100 years old it is in really good shape. 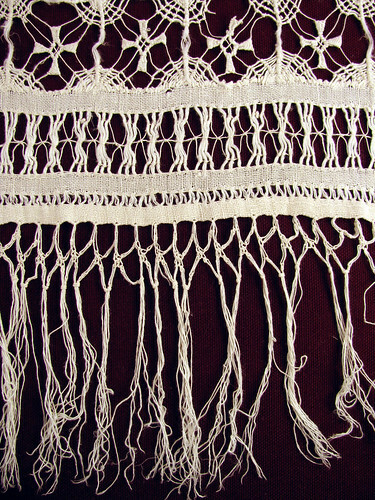 There is a middle area of solid linen approximately 15 inches long with the side finished in hem-stitching. This may have been a school practice piece which would explain it coarseness. This entry was posted on Saturday, April 4th, 2009 at 3:00 am and is filed under Lace, Needlework and Vintage. Tagged: Drawn-thread, Lace, Needlelace, Needlework, Vintage. You can feed this entry. You can leave a response, or trackback from your own site. WOw, that is beautiful. I love drawnwork.